Vacuum Pumping System of the RNVS series Two Stage Vacuum Pump Set is designed especially for transformer vacuum evacuating. It is puling vacuum to the transformer tank very high efficiency. 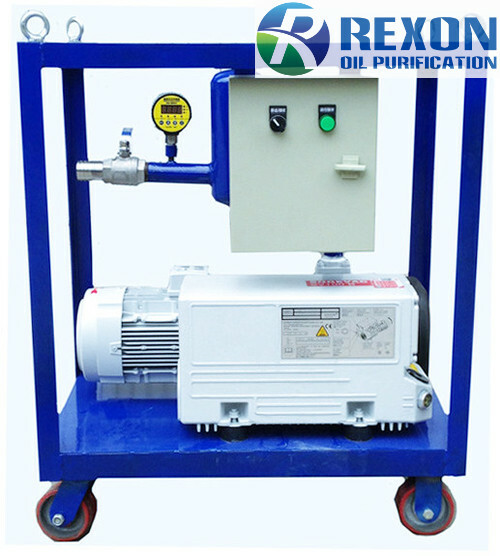 The Vacuum Pumping System | Two Stage Vacuum Pump Set is consist of a basic vacuum pump and a roots vacuum pump/booster, and the operation panel, connecting pipes for the whole structure. A basic vacuum pump is used for producing a suitable vacuum degree for the roots vacuum pump/booster. a roots vacuum pump/booster is used to enlarge vacuum degree to be a limited high value. And such two stage vacuum pump set can achieve a 1PA vacuum degree for the vacuumizing process for transformer tank. Please see the picture which is showing the vacuum degree of 1.7PA during the operation test for the Two Stage Vacuum Pump Set. Rexon vacuum products can easily solve your power transformer vacuuming problem, high efficiently finish your on-site work for transformer vacuum evacuation. We also offer customized solutions too, for example to produce a three stage vacuum pump set for some super high requirements on transformer vacuuming issue.